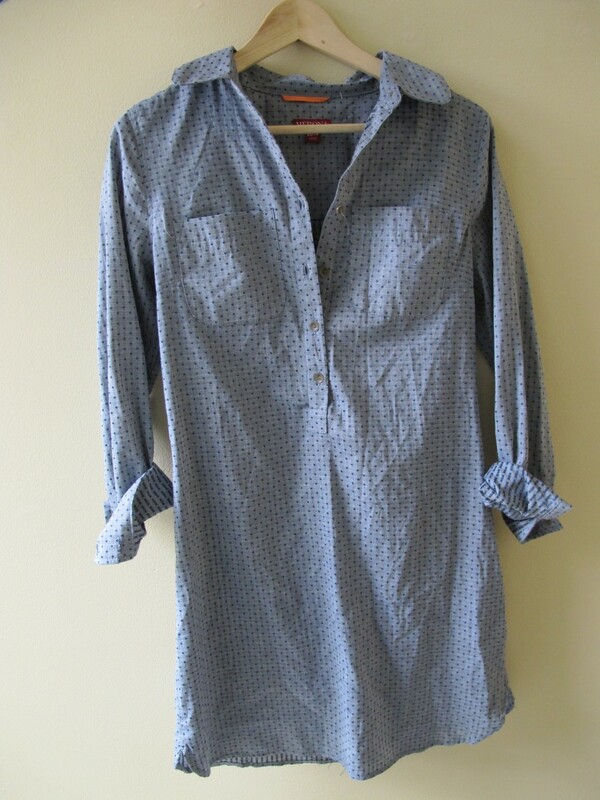 What to Do When a Favorite Shirt Dies? The thrift gods must have been having a laugh the day I posted about loving popover tunics, because as I was bending over to put my kid in the car seat after work, I heard an unmistakable rrrrrrip in the region of my shoulder blades. 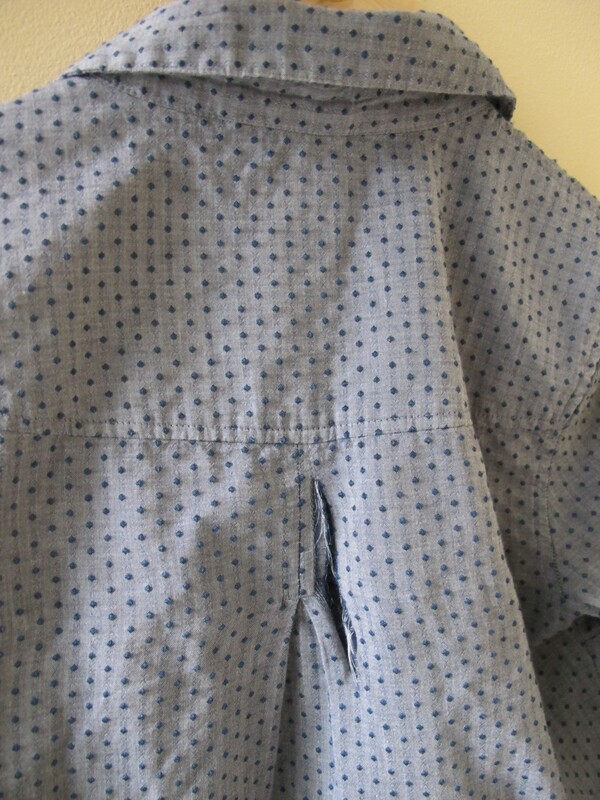 I was wearing the popover tunic I had had tailored just a few weeks before, and sure enough, it now had a big tear right down the back placket. It had been just a touch tight in the shoulders; nothing to suggest rejecting it at the thrift store or to cause discomfort during the many wearings since, but I guess I can’t be completely surprised. And it was 100% cotton, nothing synthetic that shreds easily….but it was also a Target brand, so I shouldn’t have expected stellar quality. That’s a pretty sizable hole. And given its location, there’s no way to patch that sucker without making the garment even tighter, thus setting myself up for further disappointment. I grabbed it, knowing it would fit without having to haul my toddler into the dressing room. Now the only question is: get it tailored again to replace the popover tunic hole (literal & figurative) in my wardrobe, or leave it as a shirt dress for summer work and play? Given that I have 3 other popover tunics in my lineup, and nary a light cotton dress to my name, I’m going to leave it as is for now and wear with leggings or bare legs, depending on the weather. Plus, if you think of this as one garment, I’ve now spent $27 ($6 for original shirt + $15 for tailoring + $6 for replacement shirt dress), and I’d rather not pay for a second round of tailoring. There’s only so much money I want to spend on a garment that may, in all frankness, rip on me again. Do you think I’m crazy to buy a duplicate of a garment that’s ripped on me once already, even if I’m paying thrift store prices? 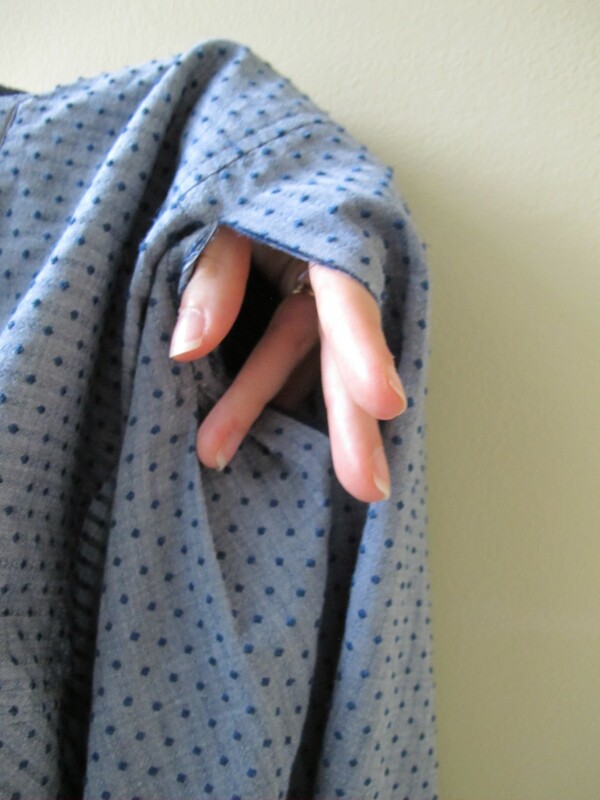 Do you have any suggestions for reinforcing the placket seam to prevent a repeat disaster? Do you like the shirt dress or the tunic version better? Scroll down to comment! I have had a similar thing happen with thrifted goods. And even high end clothing has it’s breaking point. This is part of the down side to pre loved items. Because I thrift, I often have multiples in certain categories which I have to hold to a total of 3 unless I find a stellar designer piece. Neutral t’s etc. I also have one of a kind items that I wear often and when they die I look for different ones to replace them knowing I got my money’s worth out of them. Kathy–that’s a good point about high end clothing. It’s not necessarily super-well made these days and even if it is, it, too will eventually jump the shark. I nabbed 2 turtlenecks in the same color last week for just the reason you mention–normally I don’t stock up but they were both great fits and I knew I’d wear them out more slowly than if I just chose one. I like your take on one-of-a-kind items—I’ve learned to sort of mourn them when they go and then look for something else funky to replace them, knowing the whole process keeps my style fresh. It’s interesting that the rip occurred right next to the inverted pleat on the back of the shirt. (Am I looking at that correctly?) I can’t tell the details of the shirt’s construction, but I wonder if maybe just taking a seam ripper to that pleat and trying to open it up a bit would provide the additional ease that you need. I have broad shoulders (and a wide ribcage) in proportion to the rest of my body so I feel your pain on too-tight shirts! Sarah, it’s right along the stitching on either side (half a centimeter?) of the main back seam, but if you turn it inside out, it is the seam of an inverted placket. Does that make sense? So I think maybe picking that seam on either side might ease it in the way you’re describing….the rip on the shirt is too far gone to save (I think) but I’m going to try picking out the seam on the opposite side that’s still intact to see if it does what we’re imagining. If so, I can replicate it on the shirt dress. Thanks for the suggestion! !